The traditional Eight of Pentacles shows a man seated at a workbench. He is chiseling a pentacle design on disks. The completed pentacles are mounted above him. This card is usually described as an apprentice working to master his skills. It symbolizes applying yourself creatively in a trade or business. 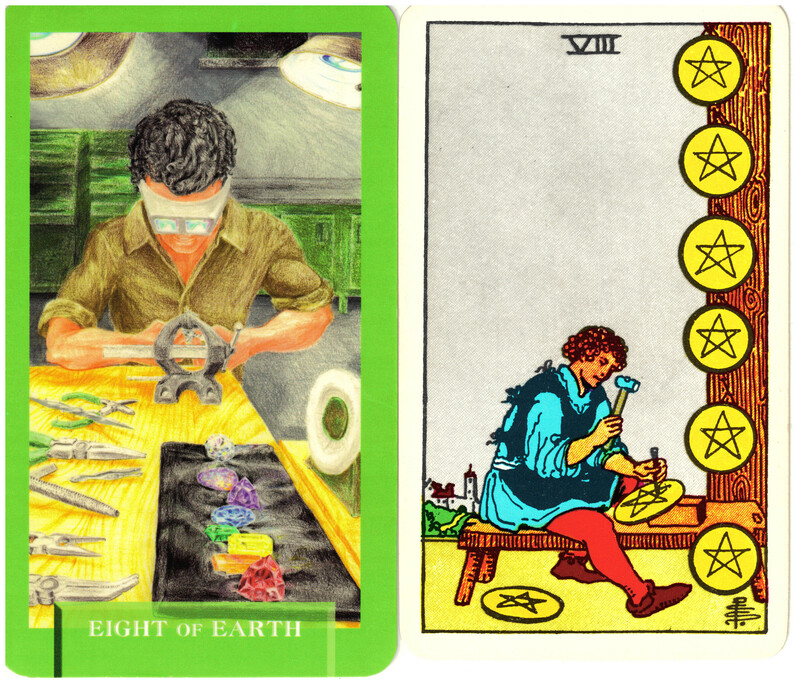 The Eight of Earth from Today’s Journey Tarot demonstrates the effort, focus and concentration the jeweler uses to become successful in his craft. Expanding Dimensions, the creators of Today’s Journey Tarot used the colors of the chakras in the jewels on his workbench to indicate his spiritual nature as well, which allows creativity to flow through him.